Painful, lonely, isolating, the Vatican’s hammer came down hard. But those who are truly in touch with the Presence of Christ are never down and out—at least not for long. Father Roy had been ordered to recant his beliefs and remain silent regardless of what his conscience was telling him. When he refused, the Vatican ordered the Maryknolls to expel him from his faith community that had been his family for forty years. Did the Vatican think that would be the end of Father Roy? Did they believe that they had shamed him sufficiently and condemned him to the poor house at age 75, expecting him to retreat and live out the rest of his days as a monk in a cave praying quietly and requesting their forgiveness? Father Roy stood with the poor fighting for justice in Bolivia in the 1970’s, was beaten, arrested and kicked out of the country. He spent the 1980s in and out of El Salvador’s civil war, reporting all the army’s atrocities being committed with U.S. tax dollars, literally becoming the “voice for the voiceless” as Archbishop Romero requested. When words alone were not enough, he fasted, prayed and was sent to prison many times for his peaceful protest of the U.S. military policies that were destroying Latin America. Silence Father Roy? Not even close. He never left the road—his campaign trail of just causes—he simply took his message further. The treatment of the LGBTQI community by the Catholic Church is appalling. Their canon law condemns that community, just as it condemns women to inferiority. We all need to know what the Catholic Church teaches on these issues. Please Google Roman Catholic Catechism section 2357, and read for yourselves the laws on the LGBTQI community and then take action, whether you are Catholic or not. We need to demand justice and the elimination of these biased, unfair, undeserved laws. Such beliefs hurt us all. Father Roy in his typical fashion has taken the issue head on. He is addressing it in his talks to colleges, both Catholic and non-Catholic. 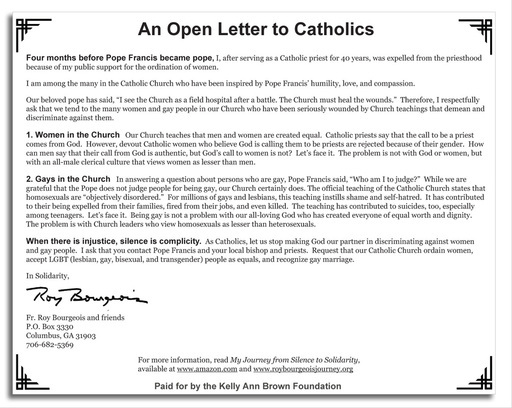 He has written and taken out two ads in major newspapers, the Boston Globe and the Chicago Tribune, calling for an end to the discriminatory laws of the Catholic Church. KABF has taken the little girl image, and Roy’s ad, and made tees, totes and car magnets. 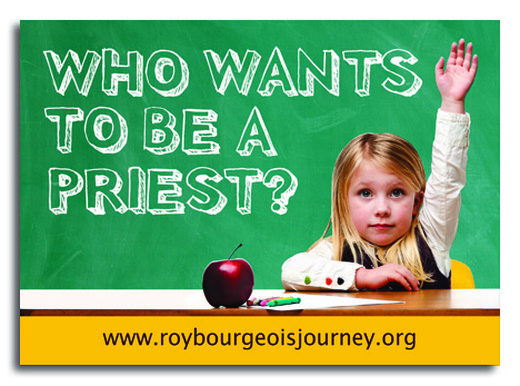 His ad is included on the back of tees and totes with the little girl’s hand raised high to WHO WANTS TO BE A PRIEST? on the front. We hope to outfit all who hunger and thirst for justice in some serious swag! Did they stop Father Roy? Not even close. Here is the ad. Buy it for your newspaper, copy and mail it out in your holiday greeting card. Spread the good news; tell everyone. Discrimination hidden under the guise of “religious freedom” is nonsense and unacceptable. Kelly wouldn’t stand for it. Click here for more information on Father Roy.